dsptime~ reports the time in milliseconds since the audio was last turned on when triggered by a bang. bang When dsptime~ receives a bang, it reports the number of milliseconds corresponding to the number of audio samples that have currently been processed. 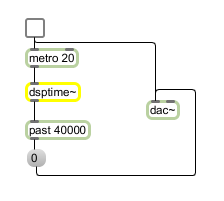 signal If a signal is connected to the dsptime~ object's inlet, dsptime~ reports the number of milliseconds corresponding to the number of audio samples that have currently been processed within the connected signal. float: The number of milliseconds corresponding to the number of audio samples that have currently been processed. The value is based on the processed audio sample count, not the real time of the millisecond timer. This means you can use the dsptime~ object as a sort of clock in conjunction with the ad_nonreal audio driver.